I feel a bit silly blogging about packing again, but when you are going on a long cruise on a boat, what you take (and don't take) is important. Though I thought we did pretty well packing for Fiona in the Caribbean, I've figured out more things that can be left behind. 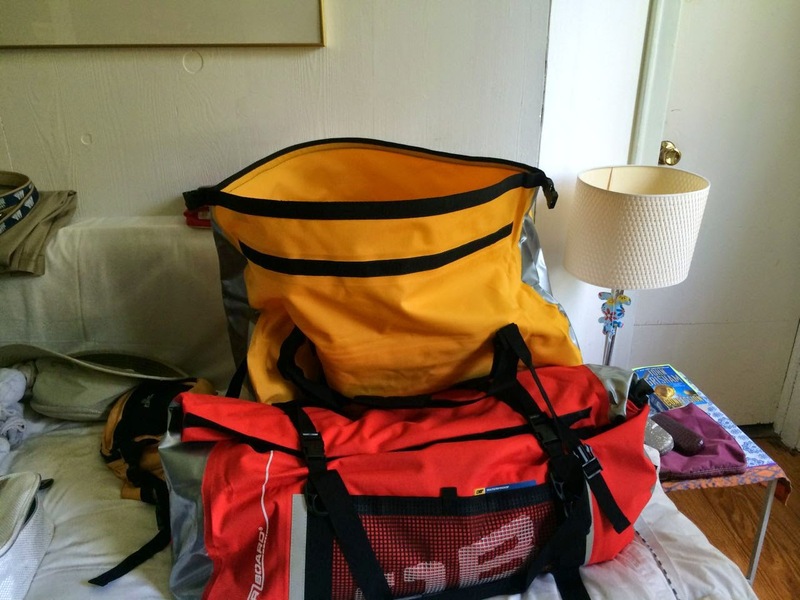 The biggest item, this time, are foul weather gear and sleeping bags, since Agnes will be supplying them. Phew. Next biggest to be cut is my laptop. I'm decidedly not retired, and have clients who depend on me keeping their systems going, even if I happen to be on a boat in France. This has always meant lugging clunky, expensive, not-waterproof laptop along. I hate it. This time, all I'm bringing is my iPad. I've figured out how to do all my support work on this simple, multi-purpose device, which also has much better battery life than my laptop. We'll also be blogging from it. As a luxury, I'm also packing my Apple keyboard, but I'd be surprised if that isn't cut next time. Like Helena, I'm also bringing more clothes this time, mainly because we'll be in France, not on some beach. I have a feeling we're just being paranoid, and we probably could have left home half our clothes. But better safe than sorry. For sailing, I'm bringing sea boots, two good hats, some warm clothes that can go under foulies, my new riggers knife, sailing gloves, and my head lamp. Those are what I now regard as the essentials. Anyway, we've managed to pack everything into fairly small, water proof duffle bags. About 30-inches long by 18-inches in diameter. By far the best we've done so far. When getting ready for Fiona--due south in warm weather--mostly I was deciding which bikini to pack. I took all of them, plus a couple of shorts, some tank tops, and a one warm cardigan. Agnes is a different story. Ah, the unknown and unpredictable weather of the English channel. Yes, it is summer, and John and I have been watching the weather carefully. Highs in the 70's and lows in the 50's, but it could be nice and warm in the 80's and also cold and rainy in the 40's. Summer? John, as always planning ahead, jolted down a list of about 100 basic items we shouldn't leave the house without. He started packing about a week ago. Today, while watching a hopeful Brazil against the mighty Netherlands in the World Cup semifinals game, I decided to do my packing. Bikinis, just in case (don't leave home without it). After the main item, toiletries --- sun block, mosquito repellent (do they even have mosquitos in France? ), creams, etc, etc. Done. Foul weather gear, bedding, all meals on board, and sailing instructions are included in this trip. Good. The next big dilemma comes from the fact that we are going to spend 50% of our time on the boat and the other 50% on shore in France. France!! Where the women are beautifully dressed, the men are elegant, and the restaurants tres chic, Oh-la-la. One cannot just go ashore wearing sneakers and a T-shirt and some shorts. Oh no, one must look cool and just out of a 5 star hotel. So all the clothes that are not wrinkle-free are out. That means most of my good dress-up clothes will be left hanging. I packed some tank tops, a polyester dress, jeans pants and jean skirts, and a cashmere cardigan. That will have to do. What to wear on the boat? Well, it might rain, it might be cold, it might be windy. The other half of my small waterproof duffle bag will be filled with long sleeve T-shirts, gym pants and shorts, warm socks and tights. Maybe a pair of cosy sweat pants for lounging in the cabin, while enjoying a glass of Pinot Grigio. And then, the worst: shoes. For all the people who know me, it is clear that I prefer Havaianas with socks over all other types of footwear. By the way, for you who are keeping up with trendy shoe fashion, Havaianas is a brand of flip-flop sandals created in Brasil in 1962. I have been wearing them since then. Of course I will be wearing them most of the time (you should try it --- cozy and comfortable), but again we are landing in France, and that is probably the only country in the world I would feel slightly conscious about my flip-flops. The Converses are packed, and I will wear my clunky wedges on the plane. The sea boots will have to stay home. Packed, house cleaned (love to return to a clean house), trash out. Off to England we go. Talk to you soon.